Photo-Boost 0-0-5 boasts more than 20% in organic components promoting turf density and rooting. This product is a result of our proprietary process and provides specific biologically fermented extracts. This advanced technology is formulated to increase turf’s photosynthetic capacity, and should be applied via foliar spray applications only. The 5% Potassium is derived from Potassium Carbonate, and then taken through our pre-digestion process to “gas-off” the oxide and provide potassium as ionic K+, which is the plant available form. 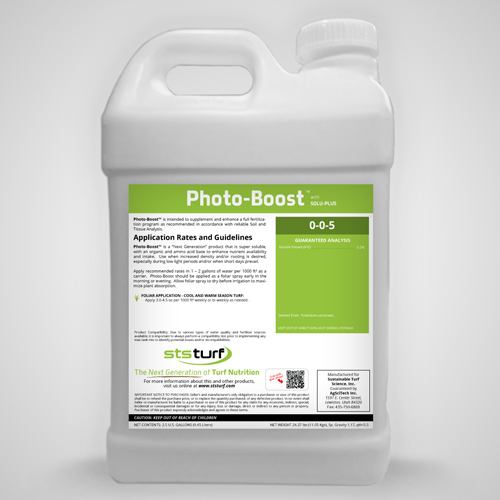 Photo-Boost 0-0-5 is ideal for maximizing photosynthetic potential, turf density and rooting when grass is under stress, short days and/or low light conditions exist. Rich in pre-digested organic matter - Over 20% organic components! Can be applied with other nutritional products as well as herbicides, insecticides and fungicides.